Naturalist John Ashley sets out on a nocturnal quest for answers to these questions and more. The result is a combination guide book, travel journal, historical narrative, photo essay and astronomy primer. Join this journey from sunset to sunrise, and help protect this trail for those who will follow. "Glacier National Park After Dark is an endlessly fascinating visual tour of the night sky, augmented by engaging written commentary. It will appeal to anyone who has ever looked up in wonder at the night sky. 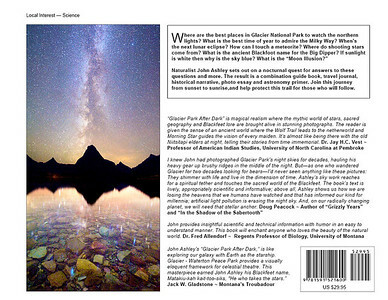 In other words, you don’t have to love, or even have visited Glacier National Park to admire this book." I knew John had photographed Glacier Park’s night skies for decades, hauling his heavy gear up brushy ridges in the middle of the night. But—as one who wandered Glacier for two decades looking for bears—I’d never seen anything like these pictures: They shimmer with life and live in the dimension of time. Ashley’s sky work reaches for a spiritual tether and touches the sacred world of the Blackfeet. The book’s text is lively, appropriately scientific and informative; above all, Ashley shows us how we are losing the heavens that we humans have watched and that has informed our kind for millennia; artificial light pollution is erasing the night sky. And, on our radically changing planet, we will need that stellar anchor. Wrapped around the spectacular photography are essays, some seat-of-the-pants how-to, and enough science to get you by (and whet your appetite in the process). Ashley is as dedicated to his photography as he is to his calling as a naturalist. And that combination really shows in After Dark. 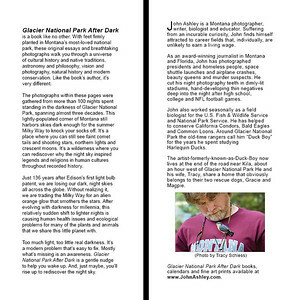 For those who want to learn more it also includes an extensive notes/bibliography section, info on dark skies and a calendar of astronomical events dates that are pertinent to night photography at Glacier National Park. If you or a loved one is a photographer with an interest in the west, this book is a ticket to explore one of America's most beautiful parks in a way that few get to appreciate it. 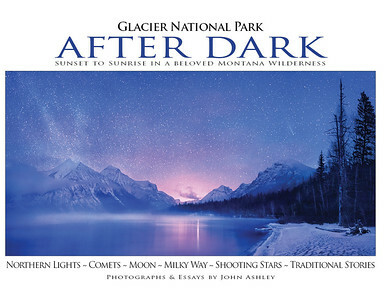 “Glacier Park After Dark” is magical realism where the mythic world of stars, sacred geography and Blackfeet lore are brought alive in stunning photographs. The reader is given the sense of an ancient world where the Wolf Trail leads to the netherworld and Morning Star guides the vision of every maiden. It’s almost like being there with the old Niitsitapi elders at night, telling their stories from time immemorial. John provides insightful scientific and technical information with humor in an easy to understand manner. This book will enchant anyone who loves the beauty of the natural world. It's our good fortune that Glacier's night sky has John Ashley to describe its appearance and properties in a way that everyone can understand. Rare for a science book, his lucid prose, dramatic photographs, and first-hand accounts serve as an accessible and entertaining guide to the splendors above. Informative and fun to read, this is a practical companion for anyone that wants to navigate the starry sky. Like a poet from the past, John's eloquent voice sings the praises of the dark that most visitors to the park never experience. Glacier National Park has rightfully been called a geologic park. John Ashley’s spectacular book provides even the casual observer with a sense of awe and views of “other” worlds, the living cosmos within which our spark of dust—the Earth—and we not-so-humble humans are bit players. There is so much to enjoy and appreciate in this beautiful magnum opus—not the least of which would be a strong dose of humility and gratitude. Thank you, John.